Any damaged or discarded stock should be recorded in the system as scrapped. This will help you to offset the stock value for accounting purposes when filing the accounts and generally considered to be a good practice. 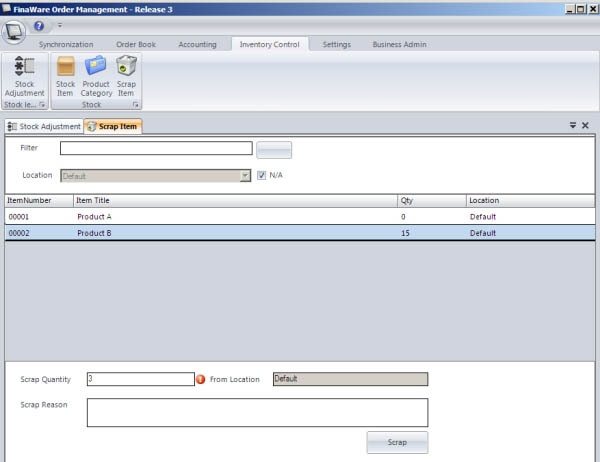 If an item has been returned by the customer due to damage and need to be scrapped, use Return Order Item function instead of directly scrapping an item. if you have purchase order for the item and returning it the supplier for a refund, use purchase order item return function instead of directly scrapping the item. The direct scrapping of item is used only when you have physical item in stock which lost its value due to damage and must be written off from the stock levels/values. The system does not take stock depreciation in to account. If you scrapping the whole stock for a specific item, make sure the stock value is correctly specified at before scrapping.